Check mode has a higher sensitivity to malfunctions and can detect malfunctions that normal mode cannot detect. Check mode can also detect all the malfunctions that normal mode can detect. In check mode, dtcs are detected with 1 trip detection logic. 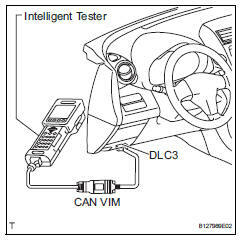 Connect the intelligent tester to the can vim. Then connect the can vim to the dlc3. Enter the following menus: diagnosis / enhanced obd ii / check mode. Change the ecm to check mode. Make sure the mil flashes as shown in the illustration. All dtcs and freeze frame data recorded will be erased if: 1) the intelligent tester is used to change the ecm from normal mode to check mode or vice versa; or 2) during check mode, the ignition switch is turned from on to acc or off. Before check mode, make notes of the dtcs and freeze frame data. Start the engine. The mil should turn off after the engine starts. 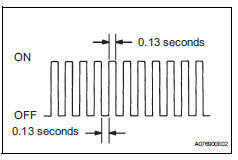 Perform "monitor drive pattern" for the ect test (see page ax-19). After simulating the malfunction conditions, use the tester to check the dtc and freeze frame data.